Over three million Americans suffer from glaucoma, which affects the eye’s optic nerves and can lead to permanent blindness or loss of vision if it’s left untreated. For elderly caregivers, it can be difficult to be well-researched and aware of the different types of glaucoma that may be developing the eyes of your senior loved one. Home Care Assistance, a leading provider of in-home care in Harrisburg, PA, hopes the following information will help senior caregivers be better informed and know what signs to look for in senior loved ones. There are several risk factors that can increase the development of glaucoma, including family history of the disease, age, previous eye injury, extremely low or high blood pressure, and race. In fact, glaucoma is five times more common in African Americans than in Caucasians. Also, those over the age of 60 are more likely to develop the eye disease as well as people with high intraocular pressure. For those who develop glaucoma, there are a number of symptoms associated with the eye disease. Elderly loved ones may experience reddening of the eyes, blurred vision, nausea accompanied by vomiting, gradual loss of vision, eye pain, a change of color on the iris, excessive tears, seeing spots, double vision, and a sensitivity to light. 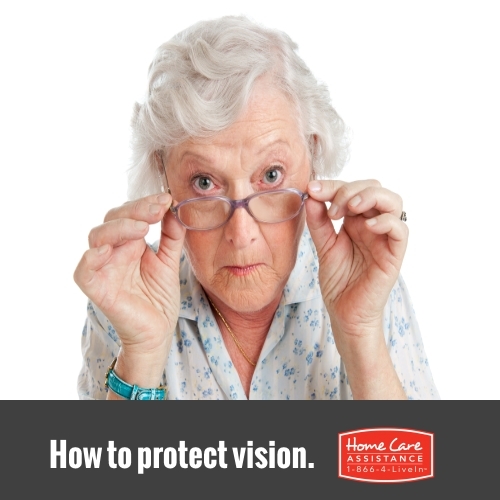 If you notice any of these symptoms, it’s imperative you take your senior relative to see an optometrist immediately. The elderly are most commonly diagnosed with glaucoma after undergoing a full vision exam that includes dilating the eye and testing the visual field. The optometrist will also measure intraocular pressure, cornea thickness, and test for nerve damage. Although a cure for glaucoma has not yet been discovered and the effects of the disease are irreversible, there are steps seniors can take to manage the symptoms and prevent the disease from escalating. Seniors are advised to take prescribed medications and eye drops on a daily basis, and may need to undergo surgery. Despite limited research on how to reduce the risk of glaucoma, diets are rich in omega-3 fatty acids are proven to prevent its development. If you’ve noticed your changes to your loved one’s eye or he or she has been complaining of some of the above symptoms, don’t wait to schedule an appointment with a medical professional. Some seniors with glaucoma also lose the ability to live completely independently. If that’s the case for your senior loved one, consider a Harrisburg live-in caregiver who can provide around-the-clock assistance for your elderly relative. Home Care Assistance thoroughly screens every caregiver, provides ongoing training in the most up-to-date care practices, and never requires long-term contracts. For more information or to schedule a free in-home consultation, call (717) 540-4663 to speak with a qualified Care Manager today.